Saint Severinus, of a noble family in Burgundy, was educated in the Catholic faith at a time when the Arian heresy reigned in that region. He forsook the world in his youth and dedicated himself to God in the monastery of Agaunum, which consisted only of scattered cells until, some time later, the Catholic King Sigismund built there the great Abbey of Saint Maurice. Saint Severinus became the holy abbot of Saint Maurice, with its distinct convents for men and women, all of whom bore voluntarily the yoke of penance and celibacy without solemn vows. The Abbot had governed his community for many years in the exercise of penance and charity, when, in 504, Clovis, the first Christian king of France, who was lying ill of a fever, sent his chamberlain to conduct the Saint to court. 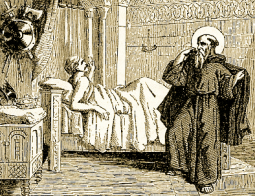 After his physicians had for two years endeavored without success to cure him, Clovis was told that the sick from all parts recovered their health by the prayers of Saint Severinus. The Abbot therefore took leave of his monks, and told them he would never see them again in this world. On his journey he healed Eulalius, Bishop of Nevers, who had been for some time deaf and dumb; he also healed a leper at the gates of Paris. And coming to the palace he immediately restored the king to perfect health, by covering him with his own cloak. He cured many other sick persons at the court and in Paris. The king, in gratitude, distributed large alms to the poor and released all his prisoners. Saint Severinus, returning toward Agaunum, stopped at Chateau-Landon in Gatinais, where two priests served God in a solitary chapel. Foreseeing his imminent death, he asked admittance among them, and they received this stranger, whom they soon greatly admired for his sanctity. His death followed shortly after, in 507. This site became the Abbey of Saint Severinus, with a beautiful church dedicated to him. His relics were later scattered, when this church was plundered. You hypocrite, first cast out the beam from your own eye, and then you will see clearly to cast out the speck from your brother's eye.